But another member is “unavailable to him”. AUSTIN STACK, THE son of murdered prison officer Brian Stack, says that he did not give Gerry Adams the names of two Sinn Féin members he alleges have information about his father’s murder. Brian Stack (48) was a staff member at Portlaoise Prison when he was shot while leaving a boxing match in Dublin in 1983. The father of three died 18 months later from his injuries. His son, Austin, has claimed that two Sinn Féin members were involved in the attack. He has not stated the source of his information. Yesterday, Adams said that he had been given two names of Sinn Féin members by Stack, a suggestion Stack rejected. I am quite clearly stating that at no stage have I ever disclosed the names of those politicians to Gerry Adams. In fact when I first spoke to Gerry Adams in 2013 he asked me if I wanted to disclose to him the names of those responsible and I told him that I would not discuss this with him. Stack called on Adams and Sinn Féin to now “suspend these two politicians pending an investigation”. 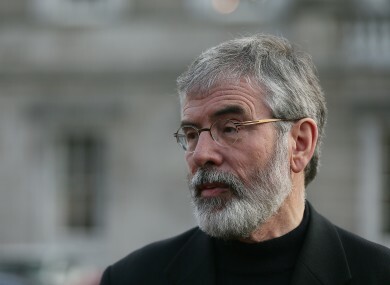 Speaking today on RTÉ’s Morning Ireland, Adams said that he had met with Stack and had spoken to one of the Sinn Féin members. “I have met with Austin Stack a number of times. I didn’t speak to members of Sinn Féin because it isn’t our job to investigate these issues. I spoke to one member and was told they had no interest in meeting with Austin Stack. He added that “the other person is unavailable to me” and said that the gardaí should be investigating these matters. Fianna Fáil’s justice spokesperson Niall Collins sharply criticised Adams today. He said it is “unprecedented” that the Sinn Féin leader would know members of his own party who were allegedly involved in Stack’s murder. “Just to say that it’s simply a matter for the gardaí, it’s just not acceptable, it’s just not good enough,” Collins said. Read: FactCheck: Does Northern Ireland really have four times more homelessness than us? Email “Gerry Adams says he asked a Sinn Féin member about Brian Stack's murder”. Feedback on “Gerry Adams says he asked a Sinn Féin member about Brian Stack's murder”.